ATLANTA - April 11, 2019 - This Monday, as the state of Massachussetts celebrates Patriots’ Day, the running world will celebrate the 123rd running of the Boston Marathon. Atlanta Track Club’s Elite team will be part of that celebration this year, as four of the Club’s elite runners – Bridget Belyeu (Lyons), Lacey Krout, Wilkerson Given and Matt McDonald – are set to make their Boston Marathon debuts. After last year’s race was marked by torrential, torturous weather conditions, 2019’s edition is currently shaping up to be another battle against the elements. Current forecasts for race morning predict another year of cold, wind and rain. Besides the elements, the Club’s athletes will battle some of strongest runners from across the world, including last year’s champions Des Linden and Yuki Kawauchi. All four of the team have already qualified for the 2020 U.S. Olympic Team Trials – Marathon, but Monday’s race will mark a first opportunity for each to try to achieve the latest Olympic marathon standards in their pursuit of qualification for Tokyo. Announced last month by the IAAF, athletes must either finish in the top 10 of an Abbott World Marathon Majo of which Boston is one, the top five in an IAAF Gold Label Marathon or hit a more stringent Olympic qualifying time – 2:11:30 for men and 2:29:30 for women. Since the qualifying window opened in January only two American women and no American men have achieved the new standards. Currently, the four boast personal bests of 2:14:07 (McDonald), 2:15:52 (Given), 2:31:00 (Lyons), and 2:38:55 (Krout). After spending the last month training at altitude in Flagstaff, AZ, they each head into this race looking to shave time off those marks, but more importantly, compete. The athletes, plus Begley, flew up to Boston on Wednesday afternoon to settle in for race week. Leading into the race, they’ll go on a course tour, enjoy a few shakeout runs, and eat as bland a diet as possible to prepare themselves for the grueling race ahead of them. 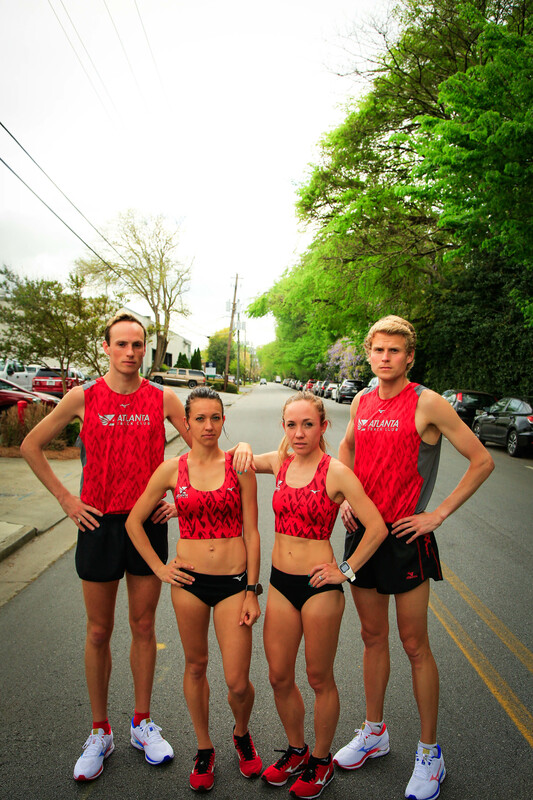 As you tune in to the race on Monday, make sure to keep your eyes on the four runners in red Atlanta Track Club singlets as they look to make a statement in their first Boston marathon. Stay up to date with all things Atlanta Track Club Elite by subscribing to our newsletter.